We had a short day ahead of us today, so armed with the recommendations from our host we departed early and soon left the main road to ride into the Middle Atlas region through some very nice small roads. Not that the national road had been boring like the previous day, mind you – this time it went through nice green fields, it had more corners and better landscape, making the start of the day a rather nice affair. When we reached the city of Kenifra we turned right off the national road and started gaining altitude through narrow roads again in the search of our first stop – a lake called Aguelmame Azigza. The open spaces of the green fields turned into cedar forests and there were patches of snow here and there, and even some ice when we stopped at a crossroads to check which way to go. 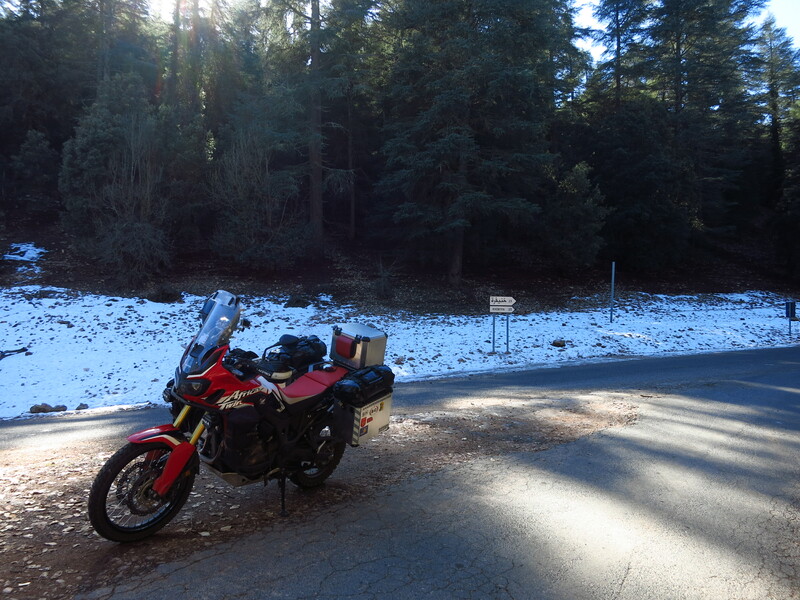 I stopped on the unpaved ground where the road split in two without realizing that there was a sheet of ice right under me, and when I put my right foot down I felt it slip and almost lost balance and dropped the bike. Fortunately, I caught it on time and moved forward a bit out of the frozen ground. 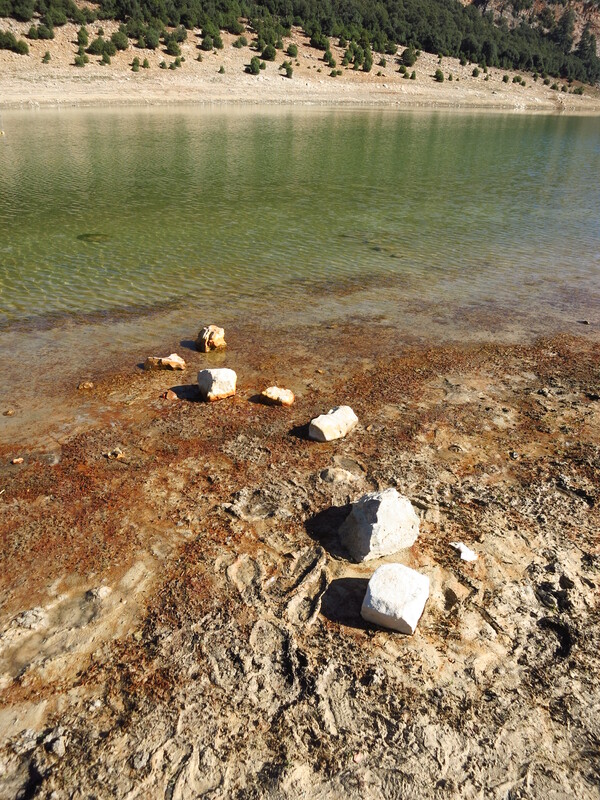 We found the lake a few kilometres further down a smaller road that turned into a dirt track for the last few hundred metres before the water. It was at the bottom of a shallow valley with a few nomad huts here and there where we heard the sound of sheep. We left the bikes on the road by the forest and walked down to the shore, quickly realising that it had been a good idea not to try to ride the bikes all the way down to the water’s edge, as what looked like dry terrain was in fact very slippery grey clay, so much so that we almost lost footing and fell several times. When we came back to the bikes we saw that we had a visitor. A monkey had come out of the trees and was walking around the bikes, probably looking for food. Gerard gave him some dates he had bought in Ouarzazate and when we got back on the bikes we realised that it had sat on all three of them, smearing mud all over the seats. It was a good thing that we had not left gloves, neck warmers or other stuff laying around, or he would have probably stolen it. 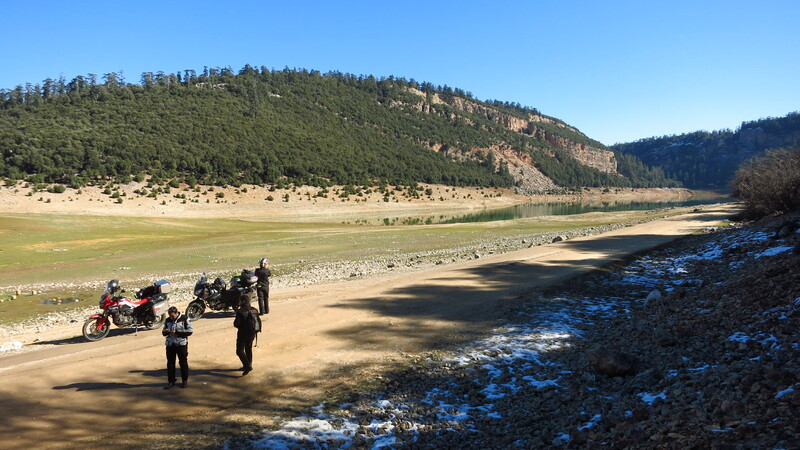 Past the lake, the road became worse, still paved but with a surface so broken and with so many potholes that we had to ride slowly. On one of the worst potholes the front suspension on Gerard’s bike compressed all the way and the front mudguard caught in the crossbar that connects both sides of the crash bars, preventing the suspension from extending again. For a moment of sheer panic, he felt that he had no steering but luckily, he was going very slowly and was able to stop safely. When he was about to get off the bike, the mudguard lip broke free and the suspension extended suddenly, making him lose his balance and almost throwing him and Raluca on the ground. A few months ago, he had had a crash with that motorbike. It had not been a serious one, but after the bike was repaired he felt some vibrations through the handlebars and had taken it to two different mechanics who had checked the front wheel and found nothing wrong. On the way down to Morocco, however, riding alongside him on long straight stretches of road while was recording some videos, I could clearly see with my naked eye that there was something wrong with the way the wheel turned. When fixing the problem with his headlamp in Errachidia I had looked down the suspension bars from above and I would swear they were slightly bent back. The incident with the mudguard confirmed my suspicions, as it should not touch some crash bars that have been specifically designed for this bike. It was clear that the suspension had bent back slightly but far enough for the mudguard to come dangerously close to the crash bars. 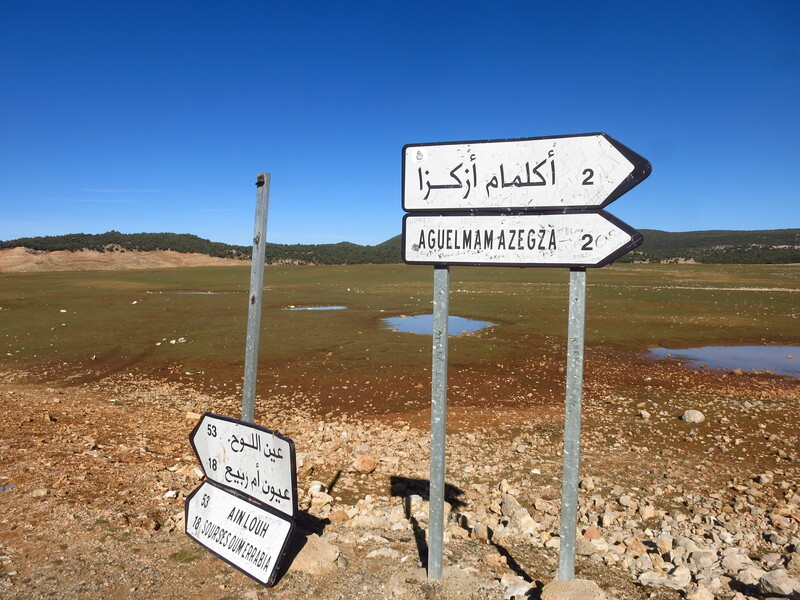 We were only a few kilometres away from our next visit, the Sources de l’Oum-er-Rbia, so we decided to ride on carefully and deal with the problem there. The sources are located in a rocky gorge and are actually 47 different sources of water that spring abundantly out of the mountain. 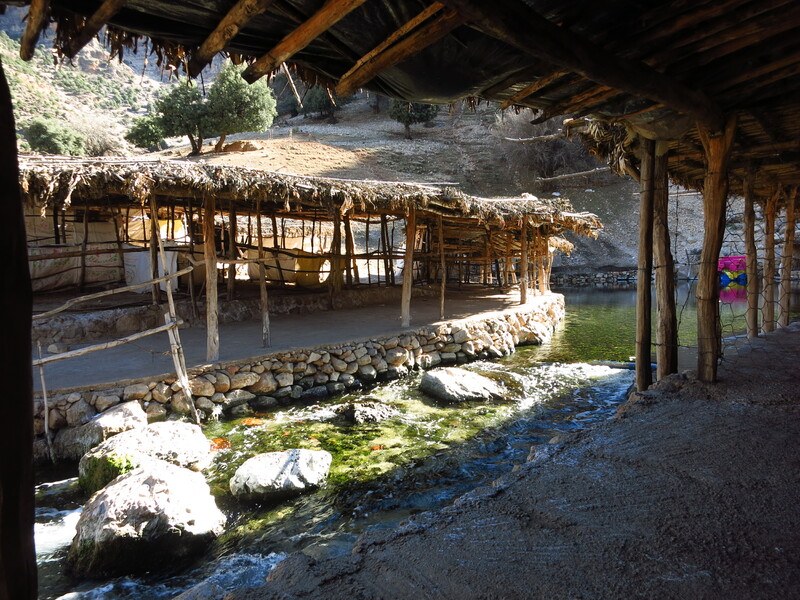 40 of them are fresh water, while the remaining 7 are salty due to minerals in that part of the mountains. There was some infrastructure in place for tourists, with small stalls made of straw, but most of them were empty – the place was well away from the main routes and it seemed that it was not the high season to visit. There were a couple of women selling bread and some places that offered a Tajin meal that smelled delicious, but we had had a hearty breakfast and were not going to eat again until reaching our final destination for the day, so we politely refused the insistent offers from our guide, a guy who had insisted on showing us around from the moment we had parked the bikes. Back where we had parked the bikes we took out our toolkits and set about dismantling Gerard’s mudguard. 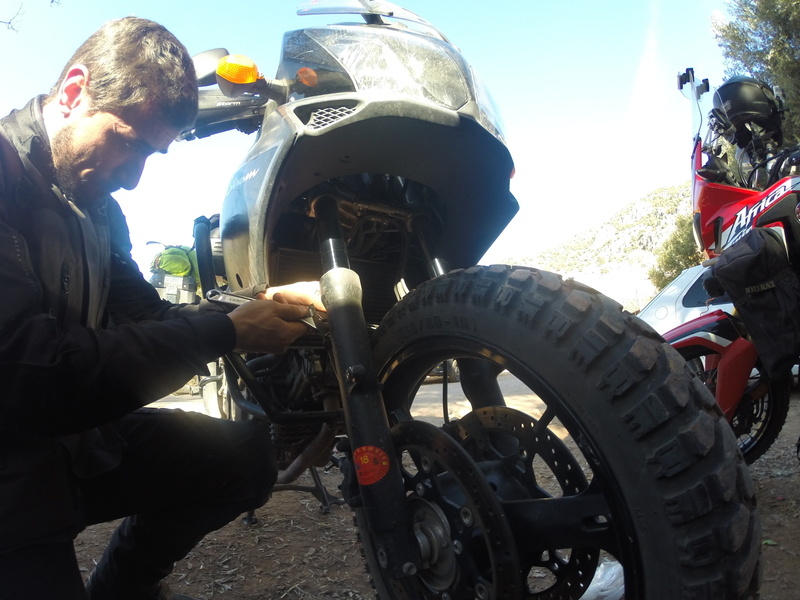 You are supposed to remove the front wheel to do so in a V-Strom, but with some pushing and pulling it came out easily enough, and he strapped it on top of a pannier for the rest of the trip, furious that neither of his mechanics had realised the problem with his suspension. I was also surprised, as it was a major problem, potentially dangerous and one of the obvious things to check after a front crash… Either both mechanics were grossly incompetent, or together with the insurance expert had decided that the damage was not bad enough to repair and left it that way, which is even worse. Having checked that the tire was safely clear from the crashbars we rode on through more amazing roads, coming into the Forêt de Cèdres again, this time a bit further to the west than the first time we had crossed it on our way down to Errachidia. 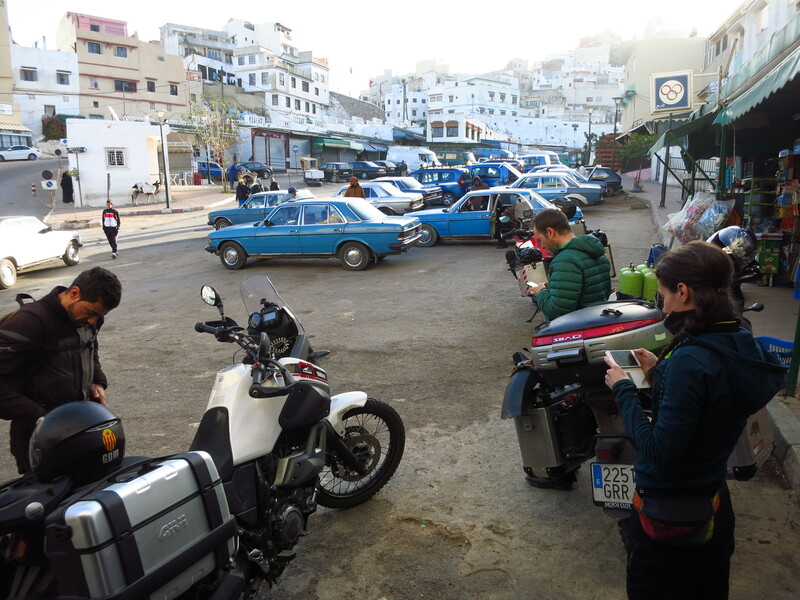 At Azrou we turned northwest, rode past Meknes and with the last light of the day reached Moulay Idriss, where we had booked a hotel for the night. Moulay Idriss is a very important city for Moroccan people, as is considered the place where Islam started in Morocco. It is here where Moulay Idriss I, after whom the city is named, arrived bringing the religion of Islam. As it is considered a holy place, tourists were not allowed to stay after sunset until 2005. 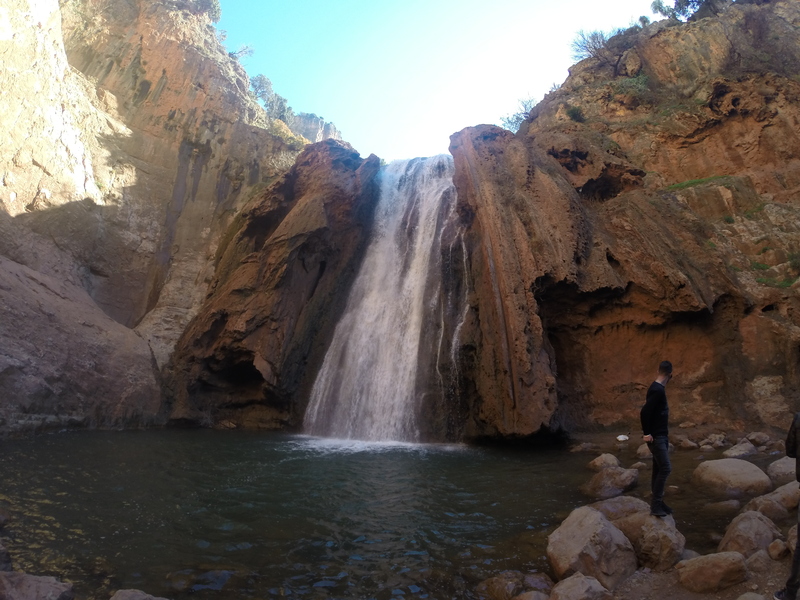 In practice this means that there is little offer in terms of accommodation, and the place is totally free of the usual tourist traps that one can find in the medinas in Fez or Marrakech. We had made a reservation in a small hotel and contacted them to ask about parking for the bikes, and when we reached the square where the hotel was supposed to be located there was a man already waiting for us to help us park the bikes. The hotel was in fact on a side street and was accessible by going down a narrow alley with steps, so we were told that the bikes would have to spend the night in the square, which also doubled as the city’s bus and taxi depot. It was a busy place, and there was a guy who would keep watch over the bikes during the night for 50 dirhams, so we were not particularly worried about leaving them there, especially as the place looked a lot safer than Marrakech. At this point on our journey it had become obvious that the country is not prepared for the winter. The houses are designed for a climate that is very hot most of the year, so the windows don’t adjust, there are big open spaces, curtains instead of doors in many places, no heating and barely adequate hot water facilities. At least this hotel had a functioning heat pump in the rooms, but the shower was the same cold affair as in most places so far. It was already dark, but we still had time to visit the market and the medina before having dinner and, like the day before in Kasba Tadla, found them to be authentic and enjoyable, with no other foreigners around, no souvenir shops and nobody harassing us to buy things. 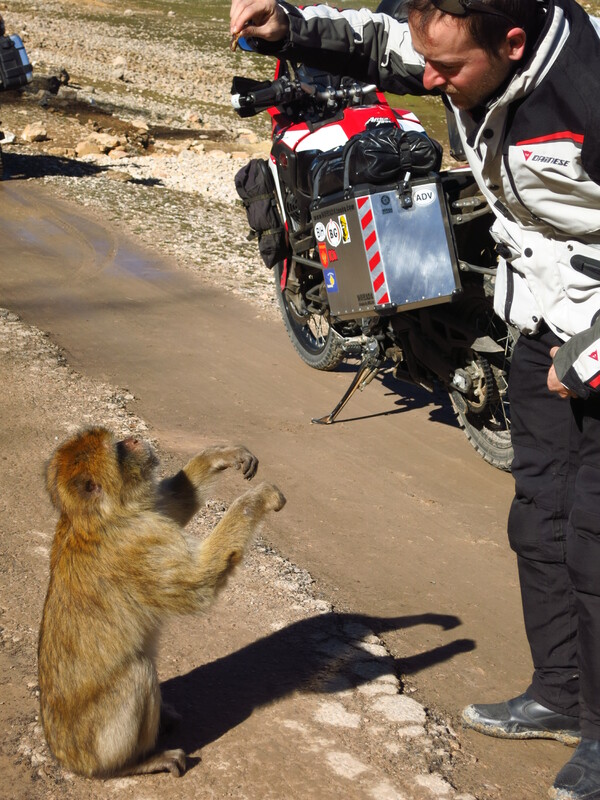 This entry was posted in Moroccan Christmas 2016, Travel and tagged Aguelmame Azigza, Azrou, Foret des Cédres, Honda CRF 1000L, Kasba Tadla, Kenifra, Morocco, Moulay Idriss, Sources de l’Oum-er-Rbia by Kilian. Bookmark the permalink. Hi Kilian. I am continuing to enjoy your posts. We left the same hotel in Moulay Idriss a few days ago. Our journey to Morocco ends tomorrow and our trip will be over in a few weeks. What finally happened with your friends bike ? That is not what you want to find on a long trip. Hahaha, I guess there is not much choice in the city… Did you visit the roman ruins in Volubilis? They are amazing! My friend completed the journey without any further incident, fortunately, and is now in talks with his insurance and the mechanics to see if he can get some kind of compensation, but it seems it might be too late and the repairs are not covered anymore. What route are you taking to go back home? Let me know if you are going to be in BCN again!